CLICK>> This blog started with the book about the power of Scotland's mountains to offer both simple enjoyment or a deeper journey of transformation. It is expanding to cover further aspects of the outdoors. 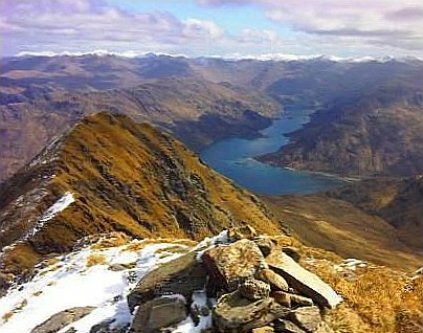 One of the many wonderous views of Scotland's mountains: Loch Hourn from the top of Ladhar Bheinn in remote and hilly Knoydart. Over the coming months I'll be posting more photos, stories and sketches together with factoids of interest to walkers. I am a keen mountaineer with a particular passion for Scotland, and for bringing mountainscapes to life for other people.